Also known as "King Christian," this Danish specialty cheese is made from partially skimmed cow's milk and is flavored with caraway seeds. This addition gives Danbo a warm, familiar taste, reminiscent of rye bread. Similar in concept to Dutch Leyden (but with a springier texture), Danbo is a festive cheese that is always a hit at parties. It partners very well with beer and wine, especially when served with dark breads, such as pumpernickel.Made from pasteurized cow's milk.Photo depicts whole 18 lb. form of cheese.We cut and wrap this item by hand. Danish Blue cheese was invented early in the 20th century by a Danish cheesemaker named Marius Boel who had a vision of emulating Roquefort. Although decidedly different from its French inspiration, Danish Blue has since become one of the most well-known blue cheese of modern times. It typically comes in a drum shape and has a white to yellowish, slightly moist, edible rind. Made from cow's milk, its fat content is 50-60% fat in dry matter, and it is aged for eight to twelve weeks. Its flavor is creamy with just the right amount of earthiness, yet it is mild enough to accommodate a variety of culinary dishes.Our Danish Blue is made on the island of Bornholm, in the east of Denmark, close to Sweden and Poland. St. Clemens is the only cheese producer in the world to win the title of World Cheese Champion twice-- in 1980 and in 1998. 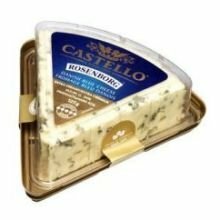 Danish blue is the consummate salad cheese, excellent crumbled atop a bed a leafy greens and drizzled with balsamic vinegar and extra virgin olive oil. Made from cow's milk, it is a white cheese with a delicate network of blue-green veins. Denmark's rich, green, grazing pastures and fertile soil contribute to the fine, consistent quality of this world-famous product. Danish Blue can be used as a special dessert cheese with fresh fruits like strawberries, pears, or peaches. It is also great in recipes that call for Crumbly Blue or Roquefort.Made from pasteurized cow's milk.Photo depicts whole 6 lb. form of cheese.We cut and wrap this item by hand.Please contact us if you would like to purchase the whole form. 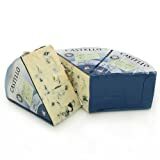 This brie-like blue cheese from Denmark is now made by a Danish-owned factory in the United States. 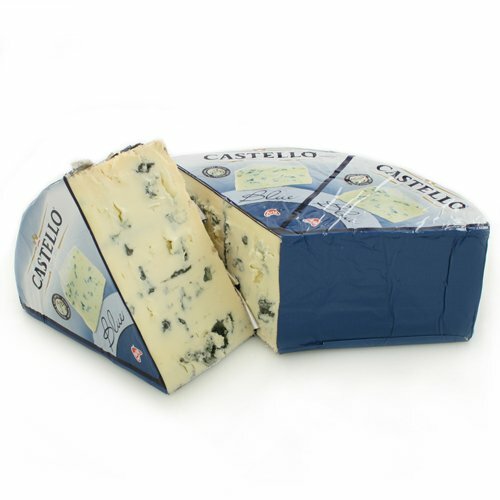 Blue Castello is richer than its cousin, Saga Blue, which is also made in the United States. Castello is a distant derivative of Italian Gorgonzola but has a higher fat content and a milder flavor. It is a perfect blue for those who like a little blue flavor without being blown away.Photo depicts whole 2 lb. half moon of cheese.We cut and wrap this item by hand.Please contact us if you would like to purchase the whole form. (Currently the whole forms come in 2 lb. half moons). 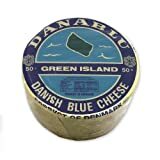 Danish Blue is also known as Danablu, the Danes invented this blue gourmet cheese in 1927 as an alternative to Roquefort. 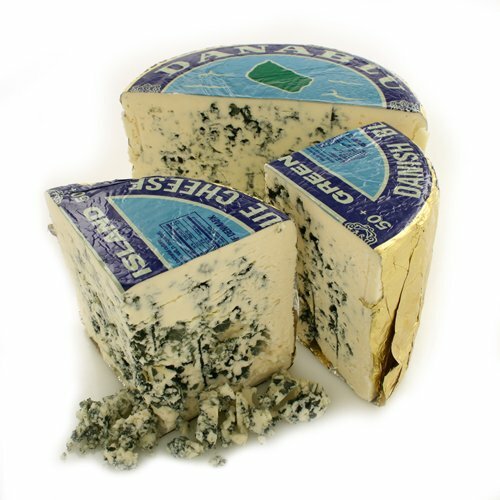 Though quite unlike Roquefort, Danish Blue cheese has been a huge commercial success and is sold worldwide. 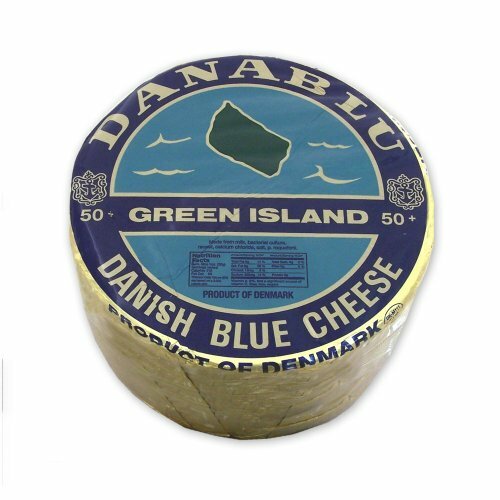 Danish Blue cheese is factory made from pasteurized milk which has been homogenized to ensure a smooth curd and clear taste. It is rindless and comes in foil-wrapped shapes. Danish Blue paste is milk white with very blue veins and a few irregularly distributed holes. It is soft and a little crumbly but surprisingly easy to slice. The flavor is distinctively sharp and salty and without qualification, quite consistently enjoyable. Danish Blue is a welcome addition to any gourmet cheese board, tasting session or simply to enjoy in one of those epicurean moments of self indulgent pleasure. 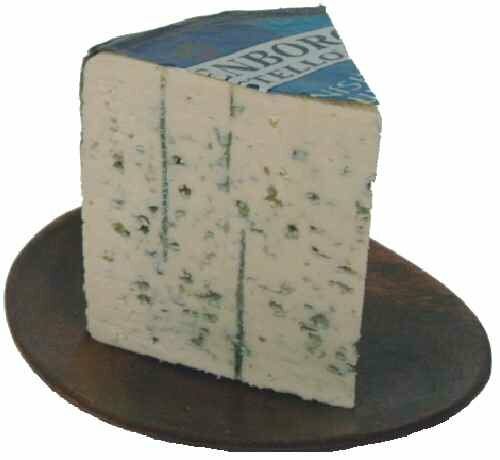 We cut and wrap Danish blue in wedges of 8 ounces and 1 pound. 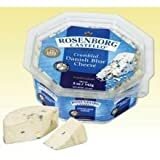 Rosenborg Crumbled Danish Blue Cheese, 5 Ounce Cup -- 6 per case. 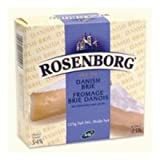 Rosenborg Extra Creamy Danish Blue Cheese, 4.4 Ounce -- 8 per case. 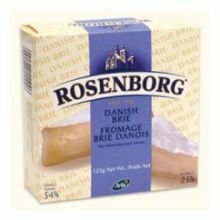 Rosenborg Danish Brie Cup Cheese, 4.5 Ounce -- 12 per case. 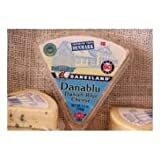 Danesland Danish Blue Cheese Wheel, 6.6 Pound -- 1 each. 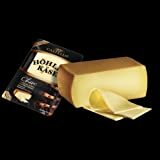 Hohlenkase (or Hoehlenkaese) is a nine-pound, cave-aged cheese along the lines of an aromatic Tilsit or especially robust Danbo. Also called Bauernhof, this cheese is aged in limestone caves over 100 feet below the surface of the earth, in the small Danish town called Monsted. This cheese enjoys the stable, year-round temperature of the cave and high humidity as it ages over several weeks. 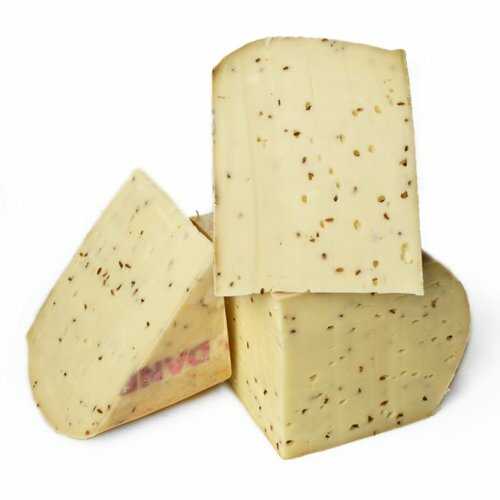 This strong and zesty-cheese is perfect for cubing for snacks, slicing for sandwiches, or melted over potatoes or noodles.Made of pasteurized cow's milk.Photo depicts whole 9 lb form.We cut and wrap this item by hand.Please contact us if you would like to purchase the whole form.